Haec Sancta Synodus marks the high-water mark of the Conciliar movement of reform. This decree, however, is not considered valid by the Magisterium of the Catholic Church, since it was never approved by Pope Gregory XII or his successors, and was passed by the council in a session before his confirmation. The church declared the first sessions of the Council of Constance an invalid and illicit assembly of bishops, gathered under the authority of John XXIII. A second goal of the council was to continue the reforms begun at the Council of Pisa (1409). The reforms were largely directed against John Wycliffe, mentioned in the opening session and condemned in the eighth on 4 May 1415, and Jan Hus, along with their followers. Hus, summoned to Constance under a letter of safe conduct, was found guilty of heresy by the council and turned over to the secular court. "This holy synod of Constance, seeing that God's church has nothing more that it can do, relinquishes Jan Hus to the judgment of the secular authority and decrees that he is to be relinquished to the secular court." (Council of Constance Session 15 – 6 July 1415). The secular court sentenced him to the stake. The Polish-Lithuanian position was defended by Paulus Vladimiri, rector of the Jagiellonian University, who challenged legality of the Teutonic crusade. He argued that a forced conversion was incompatible with free will, which was an essential component of a genuine conversion. Therefore, the Knights could only wage a defensive war if pagans violated natural rights of the Christians. Vladimiri further stipulated that infidels had rights which had to be respected, and neither the Pope nor the Holy Roman Emperor had the authority to violate them. Lithuanians also brought a group of Samogitian representatives to testify to atrocities committed by the Knights. The Dominican theologian John of Falkenberg proved to be the fiercest opponent of the Poles. In his Liber de doctrina, Falkenberg argued that "the Emperor has the right to slay even peaceful infidels simply because they are pagans. ... The Poles deserve death for defending infidels, and should be exterminated even more than the infidels; they should be deprived of their sovereignty and reduced to slavery." In Satira, he attacked Polish-Lithuanian King Jogaila, calling him a "mad dog" unworthy to be king. Falkenberg was condemned and imprisoned for such libel, but was not officially accused of heresy. Other opponents included Grand Master's proctor Peter Wormditt, Dominic of San Gimignano, John Urbach, Ardecino de Porta of Novara, and Bishop of Ciudad Rodrigo Andrew Escobar. They argued that the Knights were perfectly justified in their crusade as it was a sacred duty of Christians to spread the true faith. Cardinal Pierre d'Ailly published an independent opinion that attempted to somewhat balance both Polish and Teutonic positions. ^ Frenken, Ansgar. "Vom Schisma zur 'verfluchten Dreiheit'" [From the Schism to the 'Accursed Trinity']. Damals: 16–21. ^ For good, brief discussions of the politics of conciliarism at and after Constance, see Black, Anthony. 1998, "Popes and Councils" in The New Cambridge Medieval History, Volume VII c. 11415–c. 1500, ed by Christopher Allmand, Cambridge: Cambridge University Press, pp. 67-76; and Watts, John. 2009, The Making of Polities, Europe 1300-1500, Cambridge: Cambridge University Press, pp. 291-301. ^ Councils, Hungary: Piar, archived from the original on 2008-01-01 . ^ Stober, Karin (2014). "Sigismunds Meisterstück" [Sigismund's Masterpiece]. Damals. No. 2. pp. 24–31. ^ a b c d e f Christiansen, Eric (1997). The Northern Crusades (2nd ed.). Penguin Books. pp. 231–241. ISBN 0-14-026653-4. "Damals Magazine". Damals (in German). 46 (2). 2014. 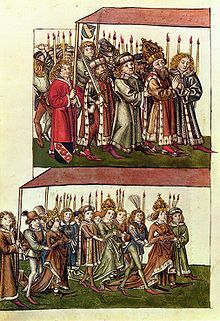 Wikimedia Commons has media related to Council of Constance.